1. 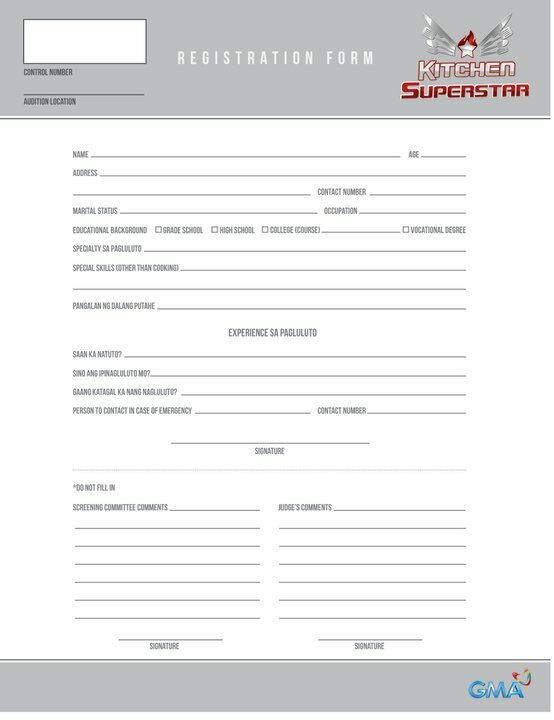 Registration forms are available for download on the Kitchen Superstar's Facebook page. Click here to download registration form. 2. Registration forms will also be available at the venue beginning 6am. Control numbers will be distributed once participants submit their completed registration form. No to contestants with culinary school diploma. No to contestants with cooking experience in a restaurant as head cook or cook in any casual fine dining or fine dining restaurant. No to contestants with any experience as restaurant cook abroad (hotels or luxury liners). 5. Bring 1 valid ID with picture and your specialty dish. Dish should not spoil easily and should be good for 1 serving only.